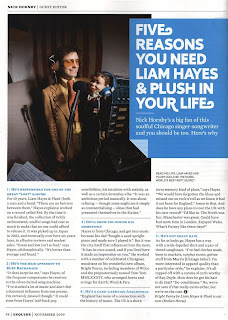 As one of the guest editors in this months Esquire, Nick Hornby suggested a profile of Liam Hayes. Patrick will be performing with his new live band at this year's CMJ in New York. 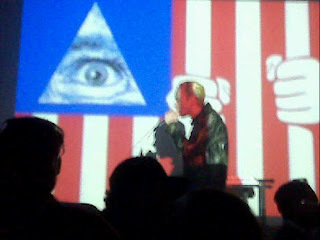 They will play at South Street Seaport on October 23rd 8pm. "The more you listen to Bright Penny, the more you sigh. For his latest turn, Liam Hayes (a singer- songwriter who is the very definition of enigmatic) has produced an album of beautifully heartfelt pop and soul. The chances of the world at large copping on to this? Zilch, zero, nada. Despite his peerless talents and spectacular voice, sporadic releases mean that Hayes remains a cult attraction. Here, on an album recorded in Chicago with musicians who played with Curtis Mayfield, Brian Wilson, Jackie Wilson, The Jacksons, Wilco and others, Hayes weaves the sort of effortlessly rapturous and dramatic sounds only a true pop visionary could conjure up. Look Up, Look Down and We Made It see him swooping and swooning away to his heart’s content. He claims on So Much Music that music almost drove him crazy; if so, this is the kind of starry-eyed madness everyone should experience. "